"They [apprenticeships] have been a big coalition success, with the number of participants doubling"
"Since 2010, the Liberal Democrats in Government have helped to create an amazing 1.6 million new apprenticeship starts — more than double the number under Labour." This is not the first time that the coalition have compared their apprenticeship record to the previous Labour government. It's true that both apprenticeship participation and starts have now doubled since the last year of the Labour government. But we can't compare the 1.6 million to the total number of apprenticeship starts under Labour, as it was measured differently before 2002/03. Apprenticeships are counted by academic year, from 1st August to 31st July, so it's not easy to divide by the May 2010 election. 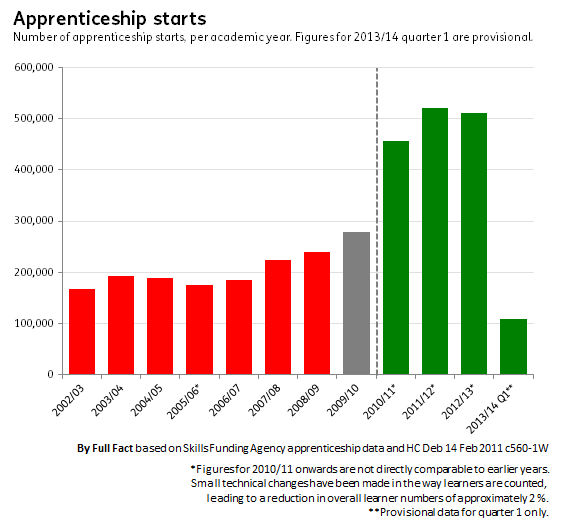 But, comparing 2012/13 to 2008/09, we find that the number of apprenticeship starts have more than doubled - from 239,900 in 2008/09 to 510,200 in 2012/13. These figures apply to England, but include a small proportion of learners counted as 'other' where the home postcode of the learner was outside of England, or unknown. You might have read the Lib Dem's blog post to be a comparison of the total 1.6 million starts to Labour's total period in Government, but they told us they meant the 2008/09 to 2012/13 starts comparison. But this only tells us about the number of apprenticeships being started each year, not those continuing from previous years. This is significant since in August 2012, a minimum duration of 12 months was introduced for apprenticeships, in response to concerns that apprenticeships were too short. Looking at participation figures instead - to reflect all those on an apprenticeship in any given year - this too has doubled in England from 444,800 in 2008/09 to 868,700 in 2012/13. The increase in participation is almost entirely down to 19+ learners, with the numbers of under 19s declining since the peak in 2010/11. It's the over 25s who are taking up apprenticeships the most. Our earlier piece covered the previous government's decision to expand the scheme among over 25 year olds and other changes under this government, as well as concerns that companies may be shifting their employees onto apprenticeships in order to access this Government funding. In particular, it is possible that the abolition of the Train to Gain scheme in 2011 (which previously provided funding for vocational training for adult employees) led to funding being sought through apprenticeships instead. In 2011, 70% of apprentices worked for their employer prior to starting their apprenticeship, compared to 48% in 2007, whereas the government's Richards Review in 2012 concluded that apprenticeships "should be targeted only at those who are new to a job or role that requires sustained and substantial training." So an increase in the number of apprenticeships isn't necessarily an increase in what Mr Richards called "'true' apprenticeships". A report by the Department of Business, Innovation and Skills found that employers with apprentices were heavily concentrated in a relatively small number of industry sectors - which represented 46% of employment. It found that 'human health and social work' was the only individual sector with an evidently higher than average number of apprentices - conversely, the 'construction' industry was felt to be offering fewer apprenticeships than it should. So apprenticeships have doubled under the coalition, with a significant portion down to an increase in the older age groups where the scope of the scheme has changed. The comparison should be worded carefully though to avoid the impression that it's a comparison of all apprenticeships started under the coalition. UPDATE 9 Mar: more detail added about the development of apprenticeships among over-25s, and the Richard Review. The headline was also changed to question format. UPDATE 11 Mar: changed annotated source of the graph on apprenticeship starts from the FE Data Service to the Skills Funding Agency. UPDATE 25 Mar: clarification added that the figures apply predominantly to England. UPDATE 30 Apr: comment added on the abolition of the Train to Gain scheme. How much does a lack of maths skills cost? Are NEET numbers at the lowest point in a decade? Are apprenticeships the "first choice" for young people? Youth apprenticeships: is the government pulling its weight? Can vocational learning tackle youth unemployment? 'Inconvenient truths'? How big is the public sector debt?